No flightstick support AND no ultrawide support? In a modern flight game? Hell, 2013's Ace Combat: Assault Horizon has better resolution and control options. This is a terrible oversight. 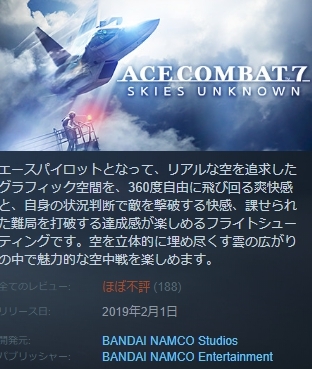 ACE COMBAT 7: SKIES UNKNOWN Launch Edition同ACE COMBAT 7: SKIES UNKNOWN Deluxe Launch Edition有咩分別?ACE COMBAT 7: SKIES UNKNOWN - Season Pass有咩DL?